Establish a “Sustainable Environment Fund for Darfur,” aimed to finance transitions to and establishment of environmentally sound developments in Darfur. Researchers collected data through focus group discussions and interviews. 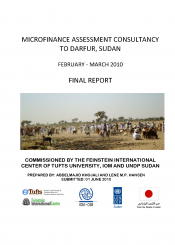 The report was commissioned by Feinstein, IOM, and UNDP Sudan.